Many years ago, I worked for a man who told us "nothing you do or say will make any difference whatsoever in the spiritual destiny of the boys and girls you are about to engage with." Then why do what we do at all? A recent survey came out saying that many people who support missionaries and non-profits stop giving because they don't feel like they matter to those they support. I hope you don't feel that way. Because you do. Because of you, there are people following Jesus in Sudan, Kenya and Tanzania. Because of you, there is a University ministry in Nairobi Kenya called the Journey, that is still making a difference 10 years after we left. Because of you, there is a church in Dar es Salaam, Tanzania which is still reaching people for Jesus, a year after we left. Certainly, there were many people involved in each of these ministries we have worked with. We all have played a role. And we believe, made a difference. One example. In 2008, we traveled to Hautvilliers, France to stay with my parents while we awaited the birth of our daughter. 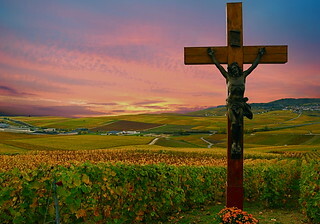 Every day, my dad, missionary David Porter, and myself would walk the hills overlooking the city of Epernay, (pictured above) Dad shared his burden that there wasn't a vibrant church in that city. We prayed. In this newsletter, I asked you to pray. Six years later, I'm happy to tell you that there is a church in that city, that is vibrant, growing, and sharing the love of Jesus. Your prayers, added to thousands of others prayers, added to the giving and work of local believers, all together rose up before God and He responded. Thank you for not hitting the "delete" or "unsubscribe" button. Thank you for sharing across your social networks. Thank you for caring, and investing, and believing. That what we together do matters. Photocredit: Epernay, France: Vincent Brassinne Creative Commons license.